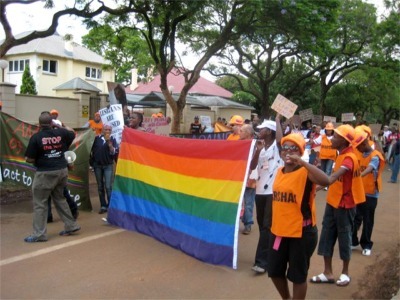 LGBT activists protest outside the Cameroon embassy in South Africa. Jean-Claude Roger Mbédé fought back tears as he spoke to the press about his experience in a Cameroon jail, where he had been held for a year and a half. “I am not sure I can put up with the anti-gay attacks and harassment I underwent at the hands of fellow inmates and prison authorities,” he told The Associated Press. Mbédé’s lawyers can still appeal to the nation’s Supreme Court, but his chances seem slim. According to records cited by Human Rights Watch, 14 people were prosecuted for homosexuality in Cameroon; 12 were convicted – a high rate even among African countries in which homosexuality is illegal. News agencies report that just two months ago, two men were convicted for their “effeminate” appearance and tastes – they were drinking Bailey’s irish cream, considered by authorities to be a “gay” drink. Human Rights Watch also reports that Mbédé’s lawyers have received death threats targeting their children.